Egypt received on Wednesday three more Dassault Aviation-built Rafale fighter jets from France, the third batch from a deal signed in 2015, the Egyptian army spokesman announced. “The new Rafale aircraft are a powerful addition to the capabilities of our air forces, as they possess high-level technical characteristics and combat systems, enabling them to perform tasks over large ranges,” army spokesman Tamer Mahmoud announced in an online statement. 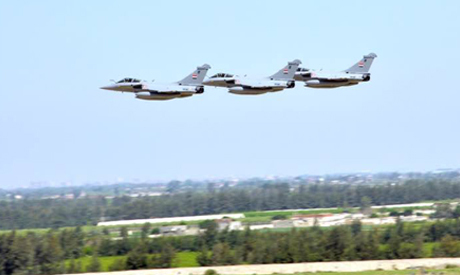 The three aircraft flew over Cairo after a flight by Egyptian pilots that took more than three-and-a-half hours after taking off from a French base for Egypt, the statement said. The deal involves the sale of 24 Rafale jets and a FREMM (Frégate Européenne Multi-Missions) multipurpose frigate. The first three jets arrived in Egypt in July 2015, while the second batch arrived in January 2016. The FREMM frigate, the Tahya Misr, was delivered in June 2015.